Board of Intermediate Education, Andhra Pradesh (BIEAP) is going to declare the final announcement of AP Intermediate 2nd Year Results 2014 which will be declared on 2nd May, 2014 on the official website of Education Board – bieap.cgg.gov.in. AP Intermediate Results 2014 for the examination of Intermediate Board Inter Class 12 Second 2nd Year 2014 will be announced shortly and will be available online on various online exam portal which provides the exam results on their own servers. After declaring the AP Intermediate Second Year Results 2014, the servers getting too much load because of that government servers might down which irritates the candidates who are eagerly waiting to see their results. We will provide various direct link servers where you can easily find the AP Intermediate Class 12 2nd Year Exam 2014 Results. The official website of Board of Intermediate Education is bieap.cgg.gov.in and results.cgg.gov.in which will firstly releases the AP Intermediate Second Year Results 2014 and afterwards other portals like www.manabadi.com, www.schools9.com etc releases them. BIEAP has conducted AP Inter Second 2nd Year Exam 2014 in March 2014 and more than 10 lakh students have appeared in Intermediate 2nd Year Examinations including Senior Intermediate Regular and Vocational Exams held in March 2014. BIEAP has provided the official notice to introduce the 2nd year final exam result date i.e. 2nd May, the same information also available in Newspaper and TV. Click on the following links to download the score card of BIEAP AP Intermediate Second 2nd Year Class 12 Exam Result, Enter the 10 digit Hall Ticket No, if it is correct then it automatically validates it and displays your marks which you can download/print for further reference. BIEAP Board has declared the AP Intermediate Junior Class 11 (1st Year) Results 2014 for both General and Vocational Examination on 29 April, 2014 on its official website – bieap.cgg.gov.in. 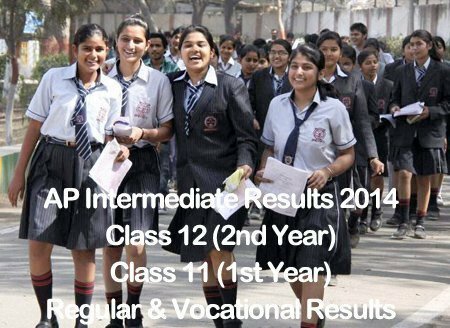 Board of Intermediate Education March 2014 Results for Class 11 (Junior) 1st Year Exam are available online for both General and vocational exam results. Click on the following link to view and download the score card. Just enter your 10 digit hall ticket no, the server will check its validity and accordingly displays the results to the respective hall ticket no. In order to view the exam result online, you are required to remember the hall ticket number. Enter your Hall Ticket No. which will displays the score card. Exam Score card contains Hall ticket no, student’s name, Grand Total and Result/Grade along with the separate details of each subject with their respective marks scored. I hope all you guys scores well but in case if you failed in the examination then don’t worry you can apply for supplementary examination which will be conducted after few weeks of result declaration. The Andhra Pradesh Intermediate Public Advanced Supplementary Examination (IPASE) issued a schedule for the supplementary exams for the students who want to retake the final exams (1st year or 2nd year). BIEAP Board Supplementary Exams begin from 25 May, 2014. For more information you can also visit the official website of Board of secondary education, Andhra Pradesh website – bseap.org.